Dr. Reddy is a sports medicine fellowship-trained and board-certified physical medicine and rehabilitation specialist (physiatrist). He completed a six-year medical school program at Stanley Medical College in India. He completed his two-year Master’s at the University of Mankato in Minnesota with an emphasis on Human Biomechanics and Exercise Physiology. 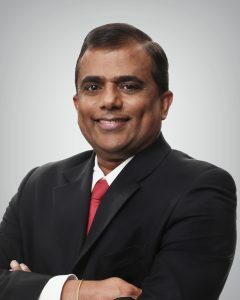 Dr. Reddy completed his four-year residency in Physical Medicine & Rehabilitation at the reputed Washington University in St. Louis, Missouri. He completed his fellowship in Sports Medicine under the tutelage of the world-renowned sports medicine specialist Dr. James Andrews at the Alabama Orthopedic & Sports Medicine Center in Birmingham, Alabama. After completion of his fellowship, he moved to Tulsa in 2000 and has been in practice ever since. He has seen over 150,000 patients. As a non-surgical sports medicine/musculoskeletal specialist, Dr. Reddy sees patients with a wide variety of orthopedic problems. He coordinates with surgical partners at Tulsa Bone & Joint on various diagnostic and therapeutic procedures. These procedures include EMG/Nerve Conduction Studies, spine injections under fluoroscopy, ultrasound guided injections of various joints and soft tissues, and more recently, regenerative medicine-related procedures (PRP, Stem Cells, etc.). Along with other partners in the group, he helps cover high school athletics, including football games on game day. Dr. Reddy enjoys teaching medical students and residents and has about 8-12 rotate with him each year. Dr. Reddy is married with two children. His son plays Division 1 golf and is an aspiring medical student. His daughter is a sophomore in college and also an aspiring medical student.